As a passionate communicator, I have been serving as UN Volunteer in Congo since October 2015. I am a Communication Specialist for the United Nations Development Programme (UNDP) in Congo Brazzaville. 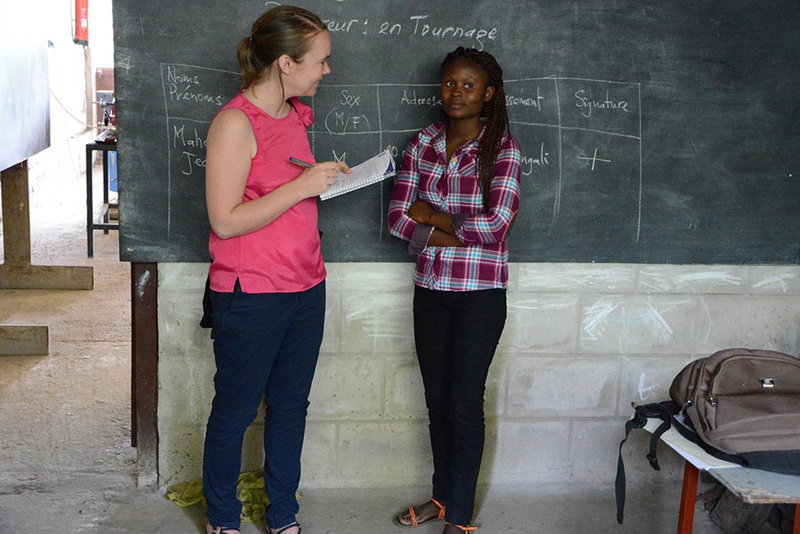 Florence Danner (France) collecting information about a young girl trained in Don Bosco Brazzaville, an organization specialized in training young displaced persons in on the Pool department region (UNDP, 2016). My daily work is very busy and captivating. I promote UNDP and the United Nations system projects and work with national and international partners to support our actions and ensure the visibility of our results. I help coordinate the communication activities of UN agencies in the country along with other UN communication officers. I meet regularly beneficiaries of UNDP, especially young people, in order to conduct interviews or reports. I have found myself passionate about communicating about the SDGs and I regularly train local NGOs on this topic. The resident coordinator of the UN System acknowledged my involvement and appointed me as focal point for humanitarian communication. Indeed, the Pool region in Congo is facing a humanitarian crisis. Some districts have been shaken by outbreaks of violence and insecurity since April 2016, causing the displacement of nearly one in three persons in this region. I was first tasked to communicate on the results of a survey on food and nutritional security, in collaboration with the World Food Programme and the UN Children’s Fund. The survey revealed that more than half of displaced families are affected by food insecurity. The global acute malnutrition rate among displaced children under 5 is 17.3 per cent and reached 20.4 per cent in the Bouenza department, exceeding the 15 per cent emergency threshold set by the World Health Organization. Due to the gravity of the situation, humanitarian partners launched an appeal for US $23.7 million in July 2017 to fund a humanitarian response plan targeting 138,000 people. I have been on the frontline to ensure the promotion of the appeal through press releases, social media, as well as the elaboration of the humanitarian response plan and its translation with help of two online UN volunteers. In collaboration with the Office for the Coordination of Humanitarian Affairs, we widely disseminated the humanitarian response plan and raised awareness with the media, on the web and through regular meetings with partners. The most urgent humanitarian needs are related to food security and nutrition, improvement of living conditions and hygiene and access to basic health services. Of the US $23.7 million needed to provide emergency humanitarian assistance in 2017, around 50 per cent was raised during the year, thanks to the generous contribution of international donors, including the Central Emergency Response Fund, the United States, China and the European Union. Humanitarian assistance distribution has started on the ground, and is vital for the displaced of the Pool region, who are deprived of everything. Yet the needs are still numerous and may increase in 2018. My volunteer assignment is coming to an end, but I am proud to have been able to communicate on this crisis and capture international attention. My experience as a UN Volunteer taught me that the solidarity of volunteers is flawless. We involve people and make a difference, one cause at a time!